Matthew Kelly is a graduate student in the English department at the University of Pittsburgh. His research focuses on the role of pedagogy in gaming communities, how video games highlight emergent forms of digital literacies, and the ways in which writing instructors might integrate games into the composition classroom. Released in 2011 to near-unanimous critical acclaim, the action role-playing game Dark Souls was hailed by many as a return to old-school gaming principles that eschewed overly-detailed narrative exposition or player tutorials in favor of a trial-and-error design philosophy and strong risk-versus-reward approach to in-game deaths. Many critics praised the game’s ability to cultivate a type of psychological torment (but also potential for satisfaction) via its unforgiving gameplay, as echoed in Keza MacDonald’s original review of the game where she states “Dark Souls’s design is so consistently dark and twisted that it actually starts to encroach on your mental well-being after extended play” (McDonald, 2011). Despite the emphasis on what was seen as a return to older design principles, equal attention was paid to the game’s radically innovative approach to online multiplayer. Unlike many other online role-playing games that operate through persistent shared universes—or, games that create virtual spaces where dozens or even hundreds of individuals can interact with each other in real time—Dark Souls operates primarily through asynchronous, indirect, or highly-restricted player interactions, such as its famous anonymous user-generated notes posted throughout the world. Such a novel approach to online multiplayer was described by Kevin VonOrd as an “unusual and wonderful contradiction” insofar as Dark Souls makes players “feel remarkably alone in this frightening place, yet simultaneously part of a large multiverse where simply playing the game makes you part of a chorus of silent voices urging each other forward” (VonOrd, 2011). In this sense, Dark Souls achieved the almost paradoxical feat of creating a gamespace that is shared by many but individually experienced as a fragmented and desolate landscape. Arguably, this unique formation of a shared virtual universe that actively instills a sense of isolation can be attributed to the game’s director, Hidetaka Miyazaki, and his fascination with contemporary network theory. In an interview with the Japanese gaming website, 4Gamer.net, Miyazaki describes how he approaches “network systems in video games from more of a social sciences standpoint” rather than strictly a technical perspective, adding that “I find network systems to be very interesting, both in general and when applied to games. Whether it’s an experience in a game or some kind of value, it can be expanded across a multitude of layers. (4Gamer.net). For the purpose of this examination, I would like to build upon Miyazaki’s comments and ask: how do the unique online multiplayer features of Dark Souls resonate with the cultural, technological, and even psychological circumstances of digitally-networked environments? Exploring this question will allow me to illustrate how the gameplay mechanics of Dark Souls actively inhabits and manipulates the unique ethical dimensions of an always-on, always-interconnected cultural paradigm. James Brown Jr. offers an incisive analysis of the ethical situations created by the incessant interconnectivity that characterizes contemporary networked life. Brown argues that the always-on nature of digital devices that structure our daily lives has created a situation where we are continuously subject to unsolicited encounters with others, be it through automated email spam, social media messages, or the occasional wrong phone number (Brown, 2015). This is an unavoidable cost, though, as networks are characterized by their open nature; networks are “open” in the sense that each node within a network must be open to communication or information dissemination from other nodes or even from other forces beyond the network (see also Thacker and Galloway, 2007). Therefore, the always-connected nature of living in a networked society entails that we are perpetually vulnerable and exposed to the influence of others (be it other people, devices, or software that utilize, exploit, or simply reinforce our interconnected status). Brown aligns this vulnerable exposure towards unexpected and sometimes unidentifiable others to Emmanuel Levinas’s theory of ethics. For Levinas, our psychological existence is constituted by how we respond to a face-to-face encounter with an externalized other whose presence is undeniable yet whose existence can fully be comprehended due to the limitations of our own subjective consciousness—not to mention the difficulties posed by linguistic mediation or culturally-influenced biases (Levinas, 2008). Levinas characterizes this encounter as akin to being held hostage insofar as the incomprehensibility of “the other” undermines the agency of our subjective comprehension and reveals our necessary reliance on another person to qualify our own sense of the self. That is to say, “the other” exposes how our psychological existence as an individual emerges as a reaction to external forces instead of emerging from some internal transcendent and timeless essence. Consequently, the notion of ethical responsibility is not necessarily concerned with how we hold ourselves liable for “the other” but, rather, how we react to our own vulnerability towards an “other” that exists beyond our comprehension and exposes the contingent nature of our psychological existence (Nealon, 1998). Ethics, then, is the process by which we interpret our own ability to respond towards “an other,” as opposed to set of absolute rules that are used to judge the moral integrity of particular actions or specific people. A key difference between Levinas’s formulation of ethics and the vulnerable exposure we experience in networked life is the anonymous or automated status of “the other.” Levinas relies heavily on the metaphor of a face-to-face encounter with an “other,” meaning he describes this interaction as if it were a literal, physical, and singular engagement with a material body that is capable of being addressed. In a way, the ethical relation with “the other” relies on a certain degree of proximity because the incomprehensible nature of “the other” is intensified by the fact that it stands immediately in front of us. However, “the other” in contemporary networks can be automated programs or anonymous collectives that have no singular discernible “face” and cannot be directly engaged with. Thus, Brown’s project seeks to build upon Levinas’s work by exploring how ethics and ethical responsibility necessarily adapt to networked environments that permit, or even privilege, the continual exposure to an “other” which denies the possibility of proximal face-to-face encounters. Dark Souls and its unique multiplayer features provide a useful territory for exploring the ethical dimensions of navigating networked virtual spaces wherein the “other” has become subsumed into a faceless and oft-inaccessible “chorus of silent voices” (to reiterate VonOrd’s sentiments). Be Wary Of . 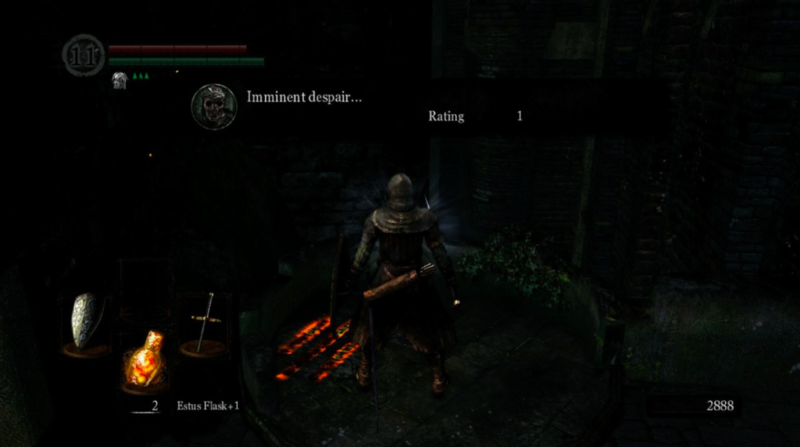 . .
One of the more memorable features of Dark Souls is the unique messaging system wherein players can use an in-game item called an Orange Guidance Soapstone to leave for others. When creating these messages, players choose from a collection of preselected phrases such as “Be wary of…” or “Look out for…” that can be connected to general descriptors such as “Ambush” or “Trap.” These notes then appear in other players’ worlds as glowing messages on the ground, which can be read and even rated for their helpfulness (see figure 1). While this system can be abused—it only takes one note proclaiming “Try jumping” next to a cliff to make new players suspicious of anonymous tips—detrimental or misleading comments are often weeded out by the player community (see figure 2). As mentioned previously, Dark Souls gives very little information to new players, both in terms of gameplay mechanics and the overall trajectory that players should take when navigating its intricate world. In many ways, these messages operate as informal tutorials or impromptu signposts because they can teach individuals how to approach upcoming situations and guide aimless players to new areas or easily-overlooked secrets. This asynchronous messaging system demonstrates the same type of vulnerability diagnosed by Brown but does so in a two-fold manner. On the one hand, these notes call attention to our own vulnerable exposure in this virtual gamespace. We cannot decide which messages appear in our own game—meaning, we are continually exposed to the unwarranted and unsolicited “arrival of others”—and the specific content of these messages reinforces the fact that we are constantly surrounding by imminent threats. Every “Be wary of…” refines our awareness of our surroundings while also forcing us to recognize our own susceptibility to attack or environmental hazards. On the other hand, these messages also operate as a ghostly trace of other people’s vulnerability within the same harsh and unforgiving landscape we inhabit. Each message persists like an orange-hued scar from some other player’s traumatic learning experiences; every hint operates as a byproduct of someone else’s own failures and frustration, which we can resonate with yet never fully comprehend seeing as there is no way to directly communicate with a note’s original author. Stumbling upon a message that exclaims “I can’t take this” in a particularly treacherous area of the game simultaneously creates the potential for camaraderie with another person yet reminds us that the specific nuances of this person’s experiences remain incomprehensible (insofar as we cannot actually witness another person’s reaction to the same world we inhabit, we can only read and rate a residual fragment of another person’s playthough that has been mediated by tightly-scripted phrases). In short, these messages operate as a type of faceless encounter that triggers our own responsibility—our ability to read these notes, to rate them, to become more aware of the dangers surrounding us or the players who have already experienced these trials— while also defying full comprehension. Although these asynchronous exchanges comprise the bulk of player-to-player interactions, there are also opportunities for direct (albeit, highly structured) engagements with others. At the onset of the game, the player begins as a wandering undead but can come across a rare item called “Humanity.” If Humanity is sacrificed at a bonfire, which operate as local save points scattered throughout the world, the player can be temporarily restored to a human. In human form, you can now view “summoning signs” on the ground left by other players. Interacting with one of these signs will call upon the person who left it, transporting them from their respective gamespace and allowing them to temporarily join your game in real time as a helpful White Phantom. Similarly, if you possess a White Sign Soapstone, you can leave your own summoning sign and allow another person to bring you into their game as a friendly companion (if said person is in human form). 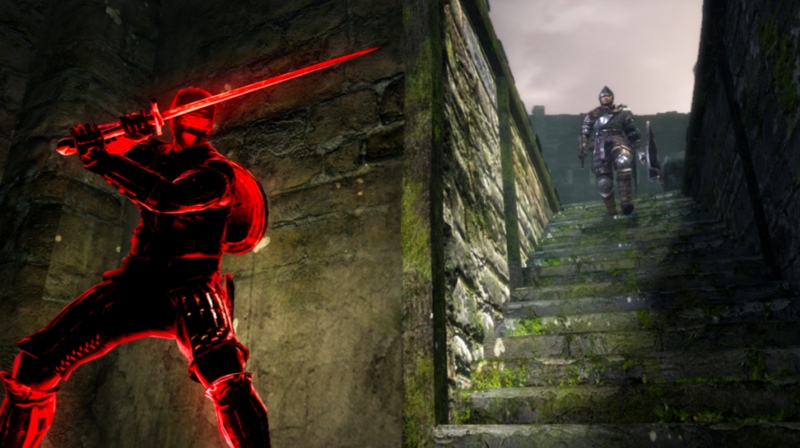 Having a partner is an immense benefit, but returning to human form also opens up the possibility of being invaded by Red Phantoms, which are typically players who have used specific items to invade another person’s game (although there are several scripted moments where NPC Red Phantoms can make an appearance). Being invaded locks down the current area and forces the player to either engage in a deathmatch or evade the Red Phantom for a ten-minute time limit, at which point the invader will be sent back to their own world (see figure 3). The process of selecting which summoning signs (or potential invaders) appear in the world is automated and beyond the control of the player. Becoming human, then, means exposing oneself to the unannounced arrival of others, be they friend or foe. Once these others do arrive, we are denied the ability to directly communicate with another player, seeing as there are no options for voicechat or text-based exchanges. Instead, we are only offered a small collection of preprogrammed gestures for our avatar along with the assumption that allies will try to be as helpful as possible and foes will put up a noble fight. While these encounters may be more direct and immediate than interacting with faceless, anonymous user-generated messages, the same tension between response and failed comprehension remains. Similar to how anonymous notes elicit a response on our part while denying our complete comprehension of the authors or experiences that led to these messages, these isolated moments of player-to-player interaction demands that we react (i.e., we must defend ourselves or help a new companion) while also reminding us of the numerous invisible players concurrently traversing the same virtual landscape. Despite recognizing the hundreds or even thousands of players that co-exist alongside of us, actually engaging with these ghostly others all at once within a single, shared, and persistent universe remains a pipedream beyond our grasp. Hence, invasions and co-op support do not necessarily signal the arrival of an other from beyond our virtual gamespace. Instead, these moments of player-to-player interaction reveal the undefinable multitude of others who remain invisible yet imminent, absent yet present, within the kingdom of Lordran. The online features of Dark Souls embodies many of the same ethical dimensions that characterize life in networked societies, and these dimensions offer the necessary foundation for rethinking how we approach the process of identity formation in virtual spaces. Nick Yee aptly points out how video games are often described as being immune from real-world socio-cultural biases, meaning that virtual gamespaces are seen as arenas where individuals can create any persona without being limited by the ideological baggage of lived reality (Yee, 2014). Dark Souls explicitly challenges interpretations of virtual gamespace as territories for unfettered identity creation ex nihilio; every unsolicited message in the world or invasion by another player forces us to continually recognize how our in-game existence is exposed to, and even contingent upon, the numerous others surrounding us. Rather than attempt to reinforce divisions between self and other—between the internal psychological space of personal identity and the external others we are exposed to when navigating virtual environments—these reminders of our own vulnerability demand that we embrace the contingent nature of our in-game identities and participate in the collective exposure that structures the gameplay experiences of other players. Rating messages, leaving notes of our own, or offering help via summoning signs all encourage us to underscore the ethical responsibility (that is, the ability to respond) that we share with other players, and these moments of automated, ambiguous, or indirect player-to-player interactions can help other players reflect upon their own vulnerability to individuals who exist beyond their immediate comprehension. To clarify, I am not arguing that there is an exact one-to-one correlation between the ethical underpinnings of Dark Souls and the real-world scenarios that often occur in networked societies—a Red Phantom and spam email are most certainly not equivalent—nor am I insisting that all Dark Souls gameplay experiences must resonate with the ethical dimensions of shared virtual spaces (seeing as there is an offline mode wherein players will only see a handful of preprogrammed messages left by the game’s developers in the opening sections of the game, and are limited to interacting with NPC White Phantoms or Red Phantoms while in Human form). Instead, I am proposing that examining Dark Souls through the critical lenses offered by Brown and Levinas allows us to further understand how video games can embody, engage with, and even begin to modify the ideological paradigms surrounding their development or reception. Ultimately, Dark Souls offers a framework for rethinking how we approach ethical responsibility amid our current technological and socio-cultural circumstances without resorting to over-idealized notions of limitless identity formation in virtual spaces. Brown, J. (2015). Ethical Programs: Hospitality and the Rhetorics of Software. Ann Arbor, MI: University of Michigan Press. From Software (2011). Dark Souls [PS3; Xbox 360; PC]. Shinagawa, Tokyo, Japan: Namco Bandai Entertainment. Galloway, A., & Thacker, E. (2007). The Exploit: A Theory of Networks. Minneapolis, MN: University of Minnesota Press. Levinas, E. (2008). “Substitution,” in Emmanuel Levinas: Basic Philosophical Writings. Eds. Adriaan T. Peperzak, Simon Critchley, and Robert Bernasconi. Bloomington; IN: Indiana University Press. Nealon, J. (1998). Alterity Politics: Ethics and Performative Subjectivity. Durham, NC: Duke University Press. Yee, N. (2014). The Proteus Paradox: How Online Games and Virtual Changes Us—And How They Don’t. New Haven, CT: Yale University Press.